The E-J mistakenly reported that the Mlily Cup was possibly sponsored by the Mlily Hotel, in yesterday’s Power Report. In fact, The Mlily Cup World Open Tournament is sponsored by Healthcare Co., Ltd. Thanks to Ke Lu for pointing out the error. 38th Kisei Leagues: Two more games were played in the new Kisei leagues on May 16. In the second game in the A League, Cho U 9P (B) defeated Kiyonari Tetsuya 9P (Kansai Ki-in) by 15.5 points. 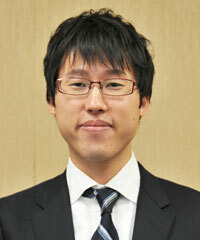 In the first game in the B League, Murakawa Daisuke 7P (Kansai Ki-in) (W) beat Mizokami Tomochika 8P by resignation. Two years ago, the Shanghai Ing Chang-Ki Wei-Chi Education Foundation hosted a group of 11 American college students to participate in a week long go summer camp in China. This year, they are hosting a new event in Shanghai, July 7-13, and inviting college students from America to compete in an international tournament. Students from 50 different colleges will be invited, and attendees will also have a chance to explore Shanghai and Hangzhou, while learning a bit more about a culture that is on the opposite side of the world. 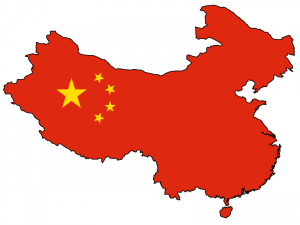 Organizer Michael Fodera reports that “housing, food, travel within China, and Ing sponsored tourist trips are all free. All ranks are welcome, even beginners as week as 20kyu. The tournament is not just limited to college students; college or university faculty members are also eligible. Though they will have to compete in the open section, which will be full of top amateur players.” To register for the event, visit the American Collegiate Go Association website. 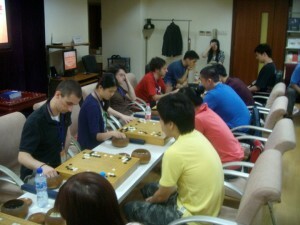 Photo by Will Lockhart: American students vs Fudan and Jiaotong University students, from the 2011 trip to China. Registration is still open for this weekend’s KGS 2013 Meijin tournament qualifier. The April qualifier featured “many exciting games and drew more than 300 observers,” reports KGS admin Akane Negishi. “One of last year’s contenders, Grande, won the April qualifier again.” The single-elimination qualifier will be held May 25-26 on an Asian/European daytime schedule (Round 1 starts at 5a EDT/2a PDT). In this fifth qualifier, the winner will become a contender for the finals which will start in November. The runner-up may also become a contender if there are 6 or more rounds in the Qualifier. The final KGS Meijin winner will receive a minimum cash prize of $500 and a special Meijin icon. Click here for details and to register. 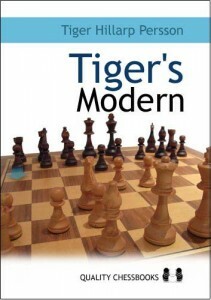 Many chess players who discover go seem to leave chess behind, but notable Swedish grandmaster Tiger Hillarp Person , the author of “Tiger’s Modern,” finds go to be a nice complement to his enjoyment of chess. Persson recently started blogging at “Chess at the Bag of Cats,” where he has set up a go section. He writes: “I started out with Go in the beginning of 2011 and, after a rapid rise to about 9kyu, I’ve been gaining around 4kyu a year since then. 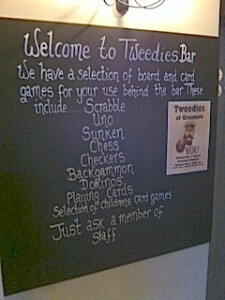 I can really recommend chess players to do this for a number of reasons. First, if you are too tactically inclined a player, then by playing Go you will be forced to think about things like ‘structure’ and ‘plans’. Secondly, if you work as a coach, reliving the struggle of being a beginner at a difficult game (like Chess – or Go) will definitely improve your understanding of those you are coaching. Thirdly, there are few things that let you appreciate the ‘nature’ of what you have learned as a chess player. Learning Go will make it obvious that you know stuff that transcends the chess board.” -Roy Laird, with thanks to Michael Bacon for sending the link. Go is returning to Hollyhock Center, in British Columbia, after more than a decade. Janice Kim 3P will lead a workshop at the popular learning center June 28 through July 3. The Hollyhock website says “Hollyhock was founded in 1983, and is Canada’s leading centre for lifelong learning, but you can also think of us as a ‘refuge for your soul’, a place that allows you access to what matters, or simply time to rest, play and achieve wellness.” Kim promises to “Increase your go skill through interactive lectures, small and large group exercises, game practice and analysis,” as well as help players “Develop critical thinking skills and improve their confidence while exploring effective and positive real world decision-making.” An award-winning author and professional 3-dan, Kim brings decades of experience to her acclaimed workshops; in 1984 she won the World Youth Go Championship, took second place in the 1985 Fuji Women’s Korean Go Champion and in 2008 she placed 4th in the World Poker Tour Bellagio Five Diamond Classic. She’s also been a contributor to the American Go E-Journal, most recently contributing commentary at the 2012 Sport Accord World Mind Sports Games in Beijing. To learn more, and to register for the workshop, click here. The 40th Maryland Open, which is also an NAMT Qualifier, will be next weekend. Organizer Keith Arnold says it is “always a strong field and all ranks are welcome.” The five-round, two-day tournament also offers prizes in all dan and kyu sections. Check out the Maryland Open section of the Baltimore Go Club webpage for information on schedule, directions, and nearby lodgings for traveling players. In a recent interview for EuroGoTV, 17-year-old German player Jonas Welticke 4d shared some insight about his experiences as an insei. 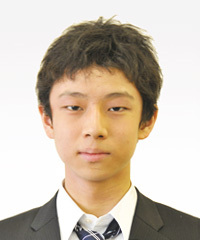 Aside from Monday study groups with Ohashi Hirofumi 5d and “playing the other insei kids every weekend,” Wilticke said there is no formal routine, and he mostly studies by himself. His current record after his first week is 10-1.